In Corona, display groups are the standard way to organize objects hierarchically. Understanding display groups is essential to building apps in Corona. A display group is a special kind of display object which can contain other display objects and even other display groups. Imagine it as a blank sheet of paper on which you "draw" images, text, shapes, and animated sprites. In app development within Corona, it's important to note that display groups are not limited by the screen boundaries. In fact, display groups are boundless and span to infinity in all directions — the physical screen edges simply frame a portion of the stage. In Corona, the stage can be considered the parent display group, and new display groups that you create are automatically added as child groups of it. All display groups, including the stage, revolve around a coordinate system. 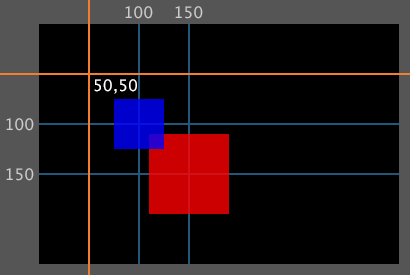 Any visual object that you place on the screen will have an x and y coordinate indicating its horizontal and vertical position respectively. 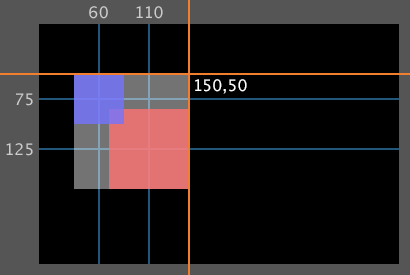 In Corona, the default origin of display groups is 0,0 which is located at the top-left corner of the stage, not the center. 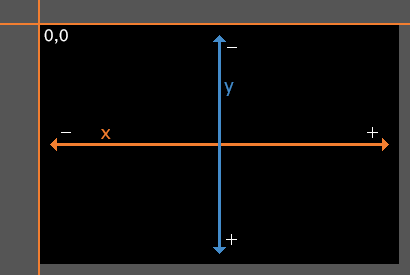 From this 0,0 point, positive x values extend to the right, while positive y values extend downward (not upward as in the Cartesian coordinate system). 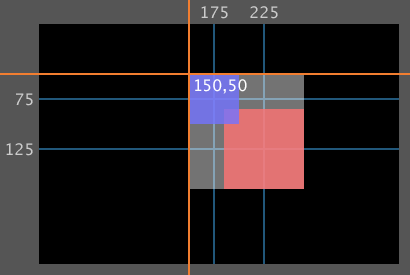 Negative coordinates are allowed as well, but as you can see in the diagram below, they will not reside within the portion of the group which is visible on the screen (the black region). Groups can, however, be moved to adjust their origin point — see Group Transforms below for more information. The "blank sheet of paper" analogy is useful for understanding Corona's drawing model. Just as if you're drawing figures on a sheet of paper, Corona display objects that are placed in a display group become part of that group (the paper). far background — contains sky, clouds, etc. foreground — contains trees, grass, rocks, etc. Each of these display groups would, in turn, contain the appropriate display objects, thus composing the painting in the proper layered order. Of course, while each layer represents a sheet of paper in the analogy, you can't actually see the "paper" itself — just imagine them as transparent sheets on which you place text, images, etc. Many display object APIs also accept the group as an inline parameter. See the Display Objects guide for API-specific links. Although display groups are essentially tables, Lua library functions like table.insert() and ipairs() are not compatible with groups. In addition, you cannot get the number of children in a display group using #myGroup. Instead, use myGroup.numChildren. 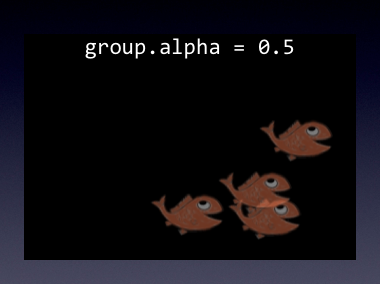 Groups can be removed via the display.remove() or object:removeSelf() functions. When you do so, all children in the group will be removed as well. However, you must still manually remove variables or other references associated with these children, otherwise they will not be freed from memory. For more details, see the Display Objects guide. When you modify a group's properties, all of its children are affected. For example, if you set the alpha property on a display group, each child's alpha value is multiplied by the new alpha of the group. Groups automatically detect when a child's properties have changed (position, rotation, etc.). Thus, on the next render pass, the child will re-render. Group transforms are applied hierarchically to the group's children. The child's transform is applied first, followed by the transform of its parent, followed by each ancestor, all the way to the stage. Consequently, children in a group are positioned relative to the parent group's position. When you modify the transform of a group (move/scale/rotate) it affects the transform of the children. In the image below, the black region indicates a theoretical Corona content area (in landscape orientation) and the intersection of the orange lines indicates the origin of the group. Note that this origin always defaults to 0,0 (the top-left corner of the content area). For testing, a red vector object has been drawn at 100,100 which signifies its center position since display objects have a default center anchor. Notice that the red box moves along with the group (its parent). 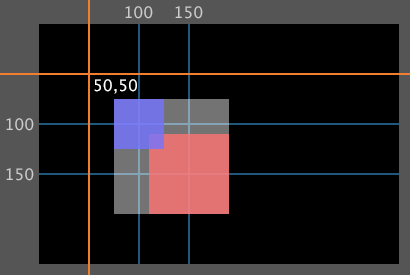 However, the object's inherent x and y position does not change — it remains at 100,100 even though the box appears at a content position of 150,150. This is because Corona manages the position of display objects in relation to their parent group. For a normal display object — an image or vector shape, for example — its anchor controls how its geometry is positioned relative to its origin. When you change the anchor of a normal display object, its origin does not change. Instead, its geometry moves relative to its origin. See the Transforms and Anchors guide for more information. 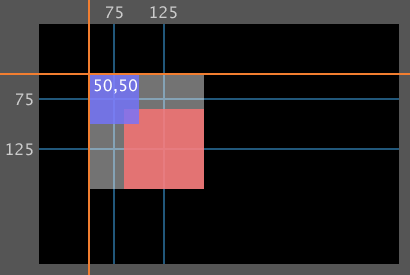 In contrast, display groups do not respect anchors by default. This is because display groups, on basic principle, are boundless and span to infinity in all directions. They do, however, possess an x and y position which defaults to 0,0 (the top-left corner of the content area). This position is the group's origin. If you refresh the project, no visual change will be apparent because, by default, display groups do not respect anchors. However, you can achieve anchor behavior on a display group by setting its anchorChildren property to true. Note that the entire group bounds move to the current origin of the group (50,50 as declared earlier). Because the anchor of the group is set to 0,0 (top-left), the top-left corner of its bounds — not its center — are positioned at the group's origin. In essence, when a display group's anchorChildren property is set to true, the children are all offset by the same amount. 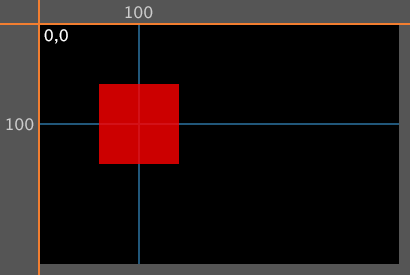 That offset is calculated in regards to the bounding box for all children in the group. Effectively, the children are treated as if they're a single unit, and the group's origin is the anchor of that unit. An alternative to using anchorChildren is to place the group inside another group ("parent group"). Changing the position, rotation, or scale of this parent group will produce similar behavior. A special type of group called a container can limit the boundaries of the group to a pre-defined region. This effectively clips the container's children within a dynamic rectangular region. See the Using Containers guide for more information. Corona will cull child objects that are outside the boundaries of the screen.